Our wetlands are important to our future. If you want to learn about the wetlands in the Okanagan, and get involved in protecting them, this site is the place to be. Welcome. Wetlands are portions of the landscape strongly influenced by water. You can recognize them by the waterloving plants along rivers, streams, lakes, springs, ponds and seeps. These green zones are one of the most ecologically diverse and productive landscapes in the world. Healthy wetlands are crucial for sustaining a majority of fish and wildlife species, maintaining functioning watersheds, providing good water quality and supply, forage for wildcrafters, and supporting people on the landscape. Today, wetlands are seen to be among the most valuable, productive, and vulnerable areas for the agriculture sector. Issues around wetlands health and management also extend beyond agriculture and include recreational, industrial and urban land use. One major issue is ensuring water quality; others include increasing agricultural sustainability, restoring biodiversity and buffering the impacts of floods and droughts. We've created a series of learning material modules for our public outreach program, including the poster above, and a PDF leaflet which you can download here. We need to meet growing public concern with a proactive, cooperative and community-based approach to address and correct wetland management issues. If we work together those actions will demonstrate good stewardship of shared resources. Stability: landscapes that maintain themselves, persist and are sustainable. We all need our wetland landscapes to be resilient, stable and provide us a long list of ecological services, whether we are farmers, anglers, bird watchers, hikers or downstream water drinkers. Wetland health varies across the Okanagan region. Our use of these landscapes represents an additive and cumulative effect which has often compromised resiliency. Agriculture, urban development, transportation networks, recreational use, industrial uses and water management have impacts. We can only ensure better wetland health if we adopt better land and water use practices and restore function to compromised wetland landscapes. Wetlands are important to us because of their agricultural benefits, the biodiversity values they represent and to address our water quality concerns. Some of our most significant wetlands have declined in their ability to perform the ecological functions that ensure these benefits and values. Healthy wetlands sustain us, especially their ability to store, filter and buffer water, and will require us to restore those that have declined, in order to maintain our quality of life. 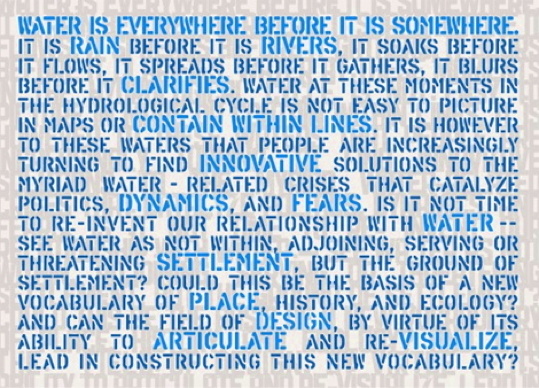 The Okanagan Wetlands Regeneration Alliance was formed to apply the principals of ecological regeneration to the wetlands of the Okanagan, which are the source and heart of the future of human habitation and economy of this area, and which are in continuous need of study, understanding and nurture. A growing list of individuals, groups, organizations, institutions and communities have joined the effort, and through their support we can undertake projects that ensure that our region continues to be one of the best places in the world to live. We invite you to join with us to conserve, restore and maintain one of our most vital natural resources, now and into the future. 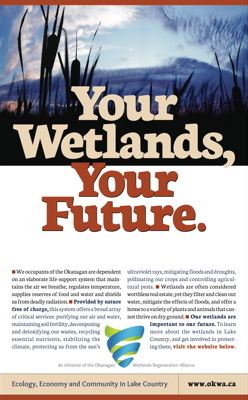 Your wetlands, your future.